Also, did anyone else get invited into the pioneer program? Nope, and I was apart of the original Pioneer program too. Odd. This week introduces the second Bilge Rat Adventure – Gunpowder Skeletons – and ends the Skeleton Thrones adventure. Those time-limited cosmetic and Doubloon rewards are now at an end, but for anyone who earned Doubloons during the event, they will remain in your wallet. 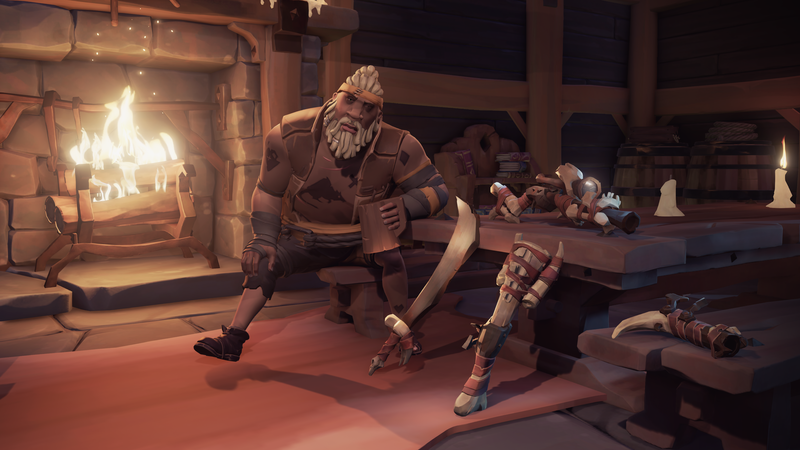 The Skeleton Thrones themselves will also remain part of the world, along with both the Commendations and Titles, so if you encounter a new pirate to the world of Sea of Thieves don’t forget to point at the Thrones and let them know how many attempts it took you to reach Marauder’s Arch! Patch 1.1.4 also brings with it multiple improvements to the mechanics of gunpowder kegs, skeleton aim changes, key performance improvements and fixes for known issues. Legendary Commendations - Legendary Commendation to earn an additional 50 Doubloons! Skeleton Accuracy - Skeletons wielding a blunderbuss or pistol have had their accuracy reduced. The cursed sails have been pretty fun so far. Last night there were four ships in an alliance. We all worked together to take down something like 8 skeleton pirate ships. It was good times all around. I just tried this for the first time. I spawn, someone screams at me and I die. -how can I not die? ...and it hides the player names of those that killed me. I just don't know. Honestly think you need to get a group to enjoy this. Playing solo didn't do it for me but I could def see this being great if playing with friends. I'm just trying to learn the game. I had a voyage all set up, then got killed by people. Now I get another one but it doesn't work anymore. Now I'm sort of locked out of the game now. I can move around but can't get new voyages to show up on the map. I actually managed to get my sloop going, but I have nowhere to go. Sailing itself is easy. I'm still extremely POd that I can't block people for some reason. Why in the world is there no "newbie" zone? Ok, starting to get the hang of this. Even with looking up some stuff online first and watching some youtube videos, I was genuinely lost. I can actually get around in my sloop by myself. I don't need to stinkin crew! I kind of like going solo sometimes. Just be prepared to hide your loot somewhere on an island if you get caught up in an attack. Hide, then hop to a mermaid/merman and sail back to where you were. (Definitely remember where you stashed your loot) It's such an awesome feeling to outsmart a galeon full of pirates. I hide stuff under palm brush a lot. They walk right by it. Why wouldn't they? Finding one other like-minded and smart player is also good, even in a galeon. You can always brig other players and do fun stuff together. Others can leave if they don't like it. Yeah I'm finally starting to get the hang of it now. My biggest threat has been rocks. You think you have so much time to stop but nope. I'm actually able to do the simple voyages solo so far. Haven't actually run into many people since early on. A few sails on the horizon but nobody seems to bother. Someone (or thing) was taking potshots at me from an island. Suddenly saw cannonballs coming my way. Fortunately they don't seem to be able to hit at full speed. As much as I was griping about the game, I find myself jumping back in regularly. There's just a lot of trial and error at first. A lot of things that are obvious in hindsight but not right away - like check for water in the boat after you hit a rock. Playing Solo is NOT how you should play this game. For maximum fun you need to play with friends. This game really is more of a "make your own fun" type of game. PvP and ship combat is very exciting. The PvE stuff is ultra boring especially if you're a Pirate Legend. I agree, but I needed to learn the game first. I would have been clueless jumping in with a group, but at least now I know what I'm doing. I hate being the person who jumps in a game clueless and expects his teammates to instruct them. What I needed at the start was a short tutorial, not teamamtes. As much as I usually hate them, this game could use it. Now that I know how to sail solo, I feel comfortable jumping on a bigger ship. Yeah, only thing to do when fighting solo is finding a big open spot in the sea and just put ship at full speed and full steer right or left, then man the cannon and hope for the best. Just got on a 4 man random crew. Only one other player had a mic but it was still fun. It is just hard to keep track of teammates off the ship. I was with my crew, then I turn around and they are gone. Now all I see is a skeleton with a barrel of gunpowder charging me. Fun though. I know I'm late to the party but once I got past the learning curve the game is a lot of fun. There is a lot to like, and I really appreciate how doing tasks manually can make the game more engaging (ie sails and such). It's a huge shame that the Melee is so lackluster. I mean, swashbuckling is a huge part of pirating!! I've sunken (lol?) a dozen hours into this now. Primarily with a friend. Honestly haven't had this much fun with a game since first destiny. I just can't get enough lol. The progression system is a bit muted and I can see how it will become tedious (as did destiny) but damn I'm having so much fun it doesn't really matter atm. Na, being a sly fox and anchoring on the far side, sneaking on a ship and taking one of their chests without then noticing is pretty great too. Yes, the social aspect of a full galeon is one of the biggest draws to this game, but it isn't the only way to be a pirate. I've been playing with full crews the last few weeks, and having a blast. I also need to level up in the merchant guild, and most crews I've teamed up with just don't want to do the animal fetching. I just think I'm better off doing that alone. The new update seems like a lot of fun. Rowboats are a nice addition. Haven't checked out the new area yet but seeing lots of videos. One gameplay question as I'm still fairly noobish - some of the islands have cannons that shoot at you. Is there some secret to going there other than just anchoring really far away and firing yourself over with a cannon? Seems like there has to be a better way. I'm assuming there's an angle they can't fire? Depends on island , there's usually an angle somewhere that's possible to get close enough to swim to shore without them firing at you. It's really just skeletons maning solo cannons though, so it's possible to shoot them with your ship if you're a good shot. Me, I usually go around and pull up the sails when it feels safe, if they don't shoot at me for at least 20 seconds I just let down the anchor and swim. I still haven’t played this game even though I have Gamepass. I've played it this week for this first time..I sank my ship twice and winded up at the wrong island..but I had a blast discovering how to do things. The game is gorgeous but Sea of Thieves needs more different kinds of content. Not just different themed quests. This is a nice update!